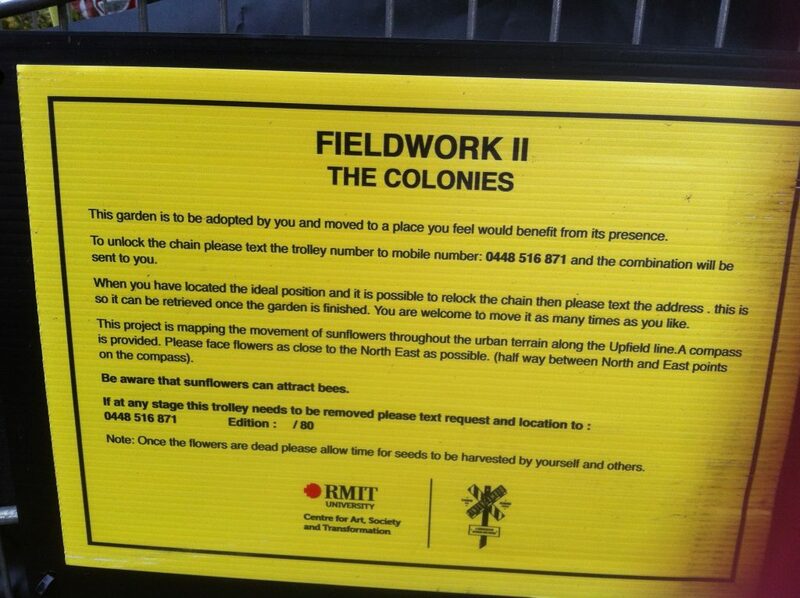 Sunflowers Fieldwork II : The colonies : Ben Morieson strikes again. Arrived at my station on Monday to discover something lovely had appeared over the weekend. 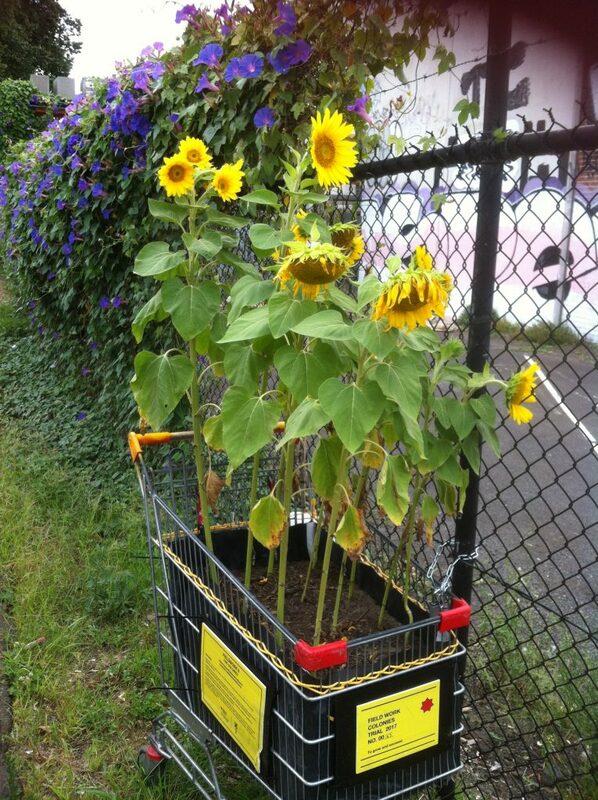 These delightful little shopping trolleys planted with sunflowers are chained to fences at stations all along the Upfield line and apparently all along the Hershey Electrical rail line in Havana as well. The chaining means that those who are amused by pushing shopping trolleys under trains will hopefully find it too much trouble to do. The trolleys have been fascinating people all week and several times I just missed taking meltingly cute pictures of small children in sun hats looking up at them. (I shall keep trying but the little so and so’s move so quickly) The adult passengers ask me if it’s a railway initiative. When I tell them it’s an art project a lot of them make harrumphing noises indicting the serious practical part of them is disapproving of such frivolity. But I always get the feeling that underneath another part of them is delighted. 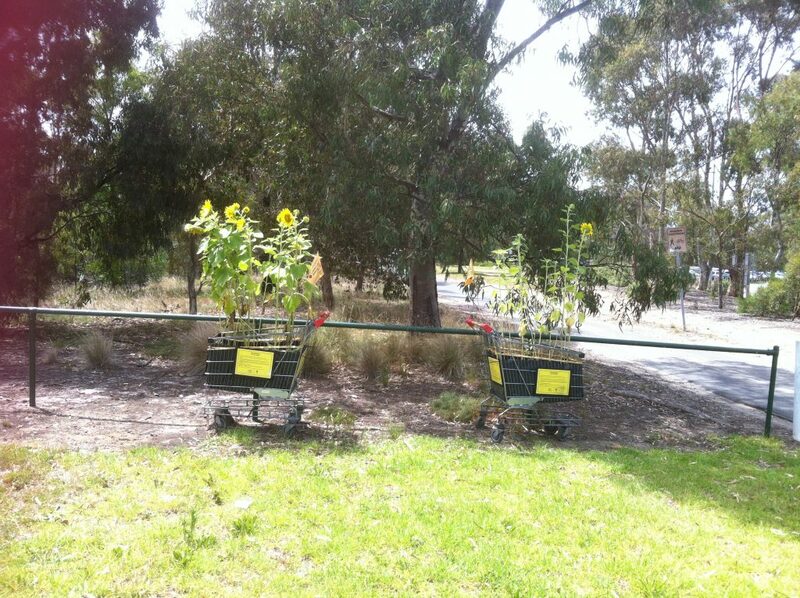 Every time I look, someone is lingering near the shopping trolley reading the little yellow tags. At Zoo station someone is watering the trolleys. At the Junction the staff have adopted theirs and keep them well watered. The trolleys at the unmanned stations are fairing less well. This week’s heat has made them look sad and dried out and I wish people would kidnap them and take them home. As far as I know none of them have traveled yet, though iIhave heard people plotting. Ben Moreison, the artist, was responsible for this was also responsible for Fieldwork 1, the huge field of sunflowers grown in a piece of waste ground near Macaulay station back in 2014. I’m glad to see he’s still sunflowering. Here’s the link to the video of it. I was a really pleasure to see the field everyday from the passing train. 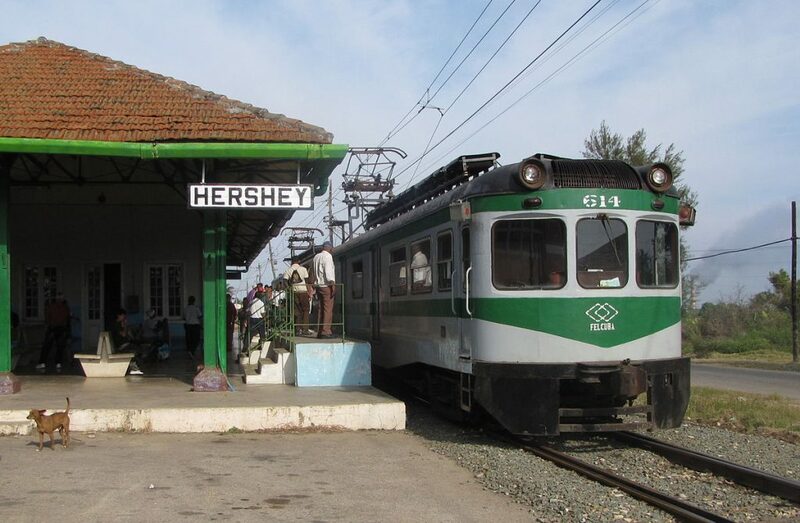 This entry was posted in Station Stories by JaneRoutley. Bookmark the permalink. As a staff member conducting station checks at those unmanned stations, I’m actually a little traumatised by these flowers. No- one has easy access to water for them, and they are sadly seemingly dying. I can’t watch, but nor do I have access into the stations, nor can I carry that much water for them all. Whatever happened to the taps we used to have on the platforms at every station years ago? Taking them away (along with the public toilets) from a publicly funded building is a disgrace. Thank you. Yes it is distressing when they start to die. I’m hoping for the best. But I do wish watering them was easier.